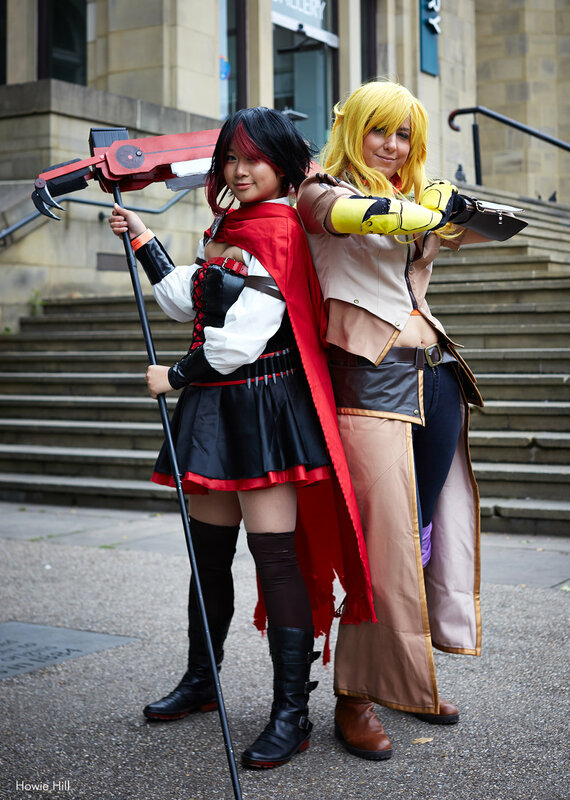 As the festival and convention grows, so too does our cosplay programme, making it bigger and better than ever! Please note, these guidelines are advice only, and any specific issues on the day we’ll address on a case by case basis. Remember, our volunteers are always there to help, so please do look out for a member of our red-shirted team, and ask if there’s anything you need, or if you have any questions. Here at Thought Bubble, we welcome and admire the endless creativity of cosplayers at our event, and cannot wait to see the creations and characters you will bring to our 2019 festival. 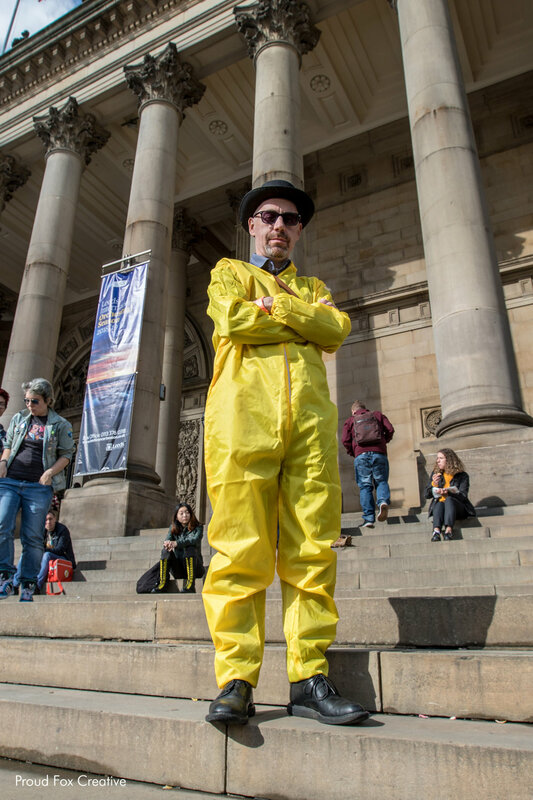 We want everyone to have as fun a time as possible, but we do ask for you to kindly abide by the few rules that we do set out and think carefully about your costume, props and their place within the festival. Regardless of gender identification, no bare chests or buttocks please. Costumes replicating military, police or official law enforcement wear must be identifiable as a costume, and not seen as an impersonation, as this is illegal. We do not allow symbols or actions of hate or prejudice, whether on costumes or not. Hate, in general, is frowned upon at Thought Bubble. We’re lovers, not haters. Cosplayers are welcome and should be made to feel welcome at Thought Bubble regardless of how much of their costume is handmade. Your costume can be any size and shape but please be aware that all indoor areas will have doors approx 3ft wide and 6ft tall. Costumes must have no sharp edges or hard pointy bits that could cause injury. Metal, wood and professionally constructed costumes are allowed, but they must have properly finished edges. If you are in any doubt, please drop us a line before the event, and if it’s right before the event, it’s better to err on the side of caution. Props of any shape and size are allowed around the outdoor festival site but may not be approved inside the convention halls. If your prop is large or deemed unfit for the busy indoor areas please be aware that we may ask you to store it in the cloakroom (for a small fee). No BB guns, paintball guns, spray canisters, replica or actual weapons, nor anything of the like. Our festival site is in a busy city centre location so this is a requirement, not just from us, but from the local police. Any realistic weapon must be entirely brightly coloured. Your “weapon” or prop is your responsibility and should not, in any circumstance, be left unattended. Anything left unattended may be removed, damaged or destroyed by the police. All weapon props should be kept sheathed, holstered or stowed while walking around and only drawn for photographs and controlled performance – Thought Bubble takes place in public areas, and we don’t want to be scaring any of the general populace. All weapon props (and props in general) be constructed from lightweight materials such as cardboard or foam and should be light enough to be lifted easily with one hand. Brightly coloured store-bought plastic toys are fine so long as they conform to British Standards. As an organisation, Thought Bubble trusts that you will act responsibly in your costume. However, if, at any point, you or anyone else is deemed to be acting irresponsibly we reserve the right to ask you to leave the event, and, in more serious cases, impose bans from our future events. By attending Thought Bubble you are consenting to being recorded. This includes being photographed, filmed, sound recorded and appearing on camera. As part of this we also require all of our guests, press and attendees to be respectful of you; you are within your right to refuse documentation. Cosplay is not consent – be respectful, and be nice. If at any time during your stay with us you’re made to feel uncomfortable, or the actions of others are stopping you having fun, please let one of our team know – they’ll all be in bright red t-shirts, and clearly identified as staff, and they’ll be happy to help. Please do try and let us know at the time, if you’re able – it’s much harder for us to take action after the fact, but if you do have an issue that you’d like to bring up outside of our events, please drop us a line. Thought Bubble Festival staff and/or the Local Authorities will have the final say on any person, prop or costume. We expect reasonable cooperation from you and will work with you to ensure the best outcome for all, but please do stick within the guidelines detailed above. We’re a friendly team, and ultimately we want you and everyone else to have an awesome time at Thought Bubble! Learn the basics of signing common cosplay terms, talking about how you make your costumes, asking permission to take photos and much more! When and where is the cosplay competition? The cosplay masquerade is hosted on the Sunday (10th) of the convention. The masquerade takes place inside the convention but the specific venue is still TBC as we are in a new convention venue this year. Check out the convention programme when it is released for details about the cosplay masquerade, including location. Thanks to the amazing folks at UKCosplay for hosting the competition, and to Travelling Man for providing the prizes! Do I have to enter the cosplay competition if I buy a cosplay ticket? Nope! It would be great if you wanted to enter (who knows what you might win!?) but you’re under no obligation to. If you want to just attend the convention in cosplay then that’s fantastic too. What are the judging criteria for the cosplay competition? The full judging criteria will be available along with the cosplay masquerade event listing when the Thought Bubble convention programme is released before the show. Check the convention programme page or follow us on social media for updates. Is there anywhere I can store my stuff while I cosplay? Yes. Full details will be available on the cosplay page closer to the convention. Is there a cosplay changing room? Do I have to wear a wristband when I’m cosplaying? Yes. It has to be visible at all times and must be worn around your wrist. It cannot be attached to props instead. You only get one wristband at the convention and you must wear it at all times, otherwise you will be refused entry into convention venues. Do you allow imitation weapons as part of cosplay outfits? If you intend to bring a replica weapon we require that it is entirely brightly coloured (as opposed to just having a bright orange safety tip). Anything with the size and shape of a real firearm could be considered a threat by the police and warrant a response, so this policy is in place so we can avoid this situation entirely. Please read the cosplay guidelines for more details and, if in doubt, leave your imitation weapons at home. Is it ok that I didn’t make my own outfit? Yes absolutely. Although some of the cosplay competition requires self-made costumes, in the convention itself you can wear store bought, home made, or any combination of the two. We appreciate your enthusiasm to cosplay over your dressmaking skills.